We've got the hottest January Sales just for you, Roomies! This limited time jackpot plays EVERY day at 11pm. And the best part – tickets are just a penny! Find a penny, pick it up, and YOU could win up to £250! Head to the lobby and get your tickets now. Good luck! The following are the terms and conditions of the Power Penny Jackpots. This Promotion is organized by the Company, as defined in the Terms and Conditions. Your participation in this Promotion shall be deemed to constitute your complete acceptance of the terms and conditions below. 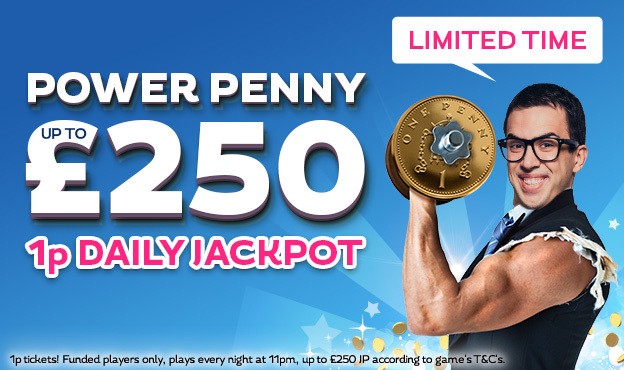 This Promotion is open to registered funded players at Gossip Bingo with respect to the Power Penny Jackpot game (the "Game"). It is a 75-ball bingo room. The game plays every night at 11pm. Cards are 1p each and players can buy a max of 96 cards to each game. This is a shared bingo game between the following bingo brands: Moon Bingo, Robin Hood Bingo, Sugar Bingo, Polo Bingo, Loony Bingo, Gossip Bingo, Silk Bingo, Diva Bingo, Bingo Giving, Cupcake Bingo. The Shared game basis enables the company to bring together users of the game ad other players who use other games operated by the Company. Terms and Conditions of the site apply to this Promotion.